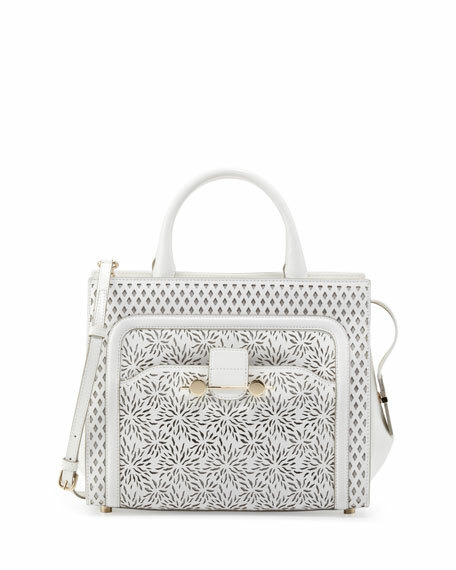 Jason Wu presents the Daphne crossbody with architectural lines and intricate laser-cuttingthe modern ladybag with on-the-go appeal. Smooth calfskin with front and back laser-cut panels. Top tote handles; thin, adjustable crossbody strap; 21 1/2" drop. Framed zip-around top shapes structured silhouette. Front pocket with flap and bar closure detail. Inside, zip pocket and two pouch pockets; faille lining. 9 2/3"H x 11 2/5"W x 5 3/4"D.